Description: The Firefly Interactive Prototyping Shield mounts on top of your Arduino Uno and provides access to a number of useful input (ie. sensors) and output (ie. motors) devices. The shield is already setup to work with Firefly's pin configuration - so simply mount this onto your board, upload the Firefly Firmata and start prototyping! The Interactive Prototyping Shield comes fully assembled. High-voltage MOSFET circuit capable of driving lights, valves, DC motors, solenoids, or anything else requiring higher voltage or current. The gate of the MOSFET is connected to digital pin 11 (PWM). Note: While this shield comes fully assembled, the Easy Stepper Driver must be purchased separately. International shipping is available. Please email info@fireflyexperiments.com to inquire about international shipping rates. Description: The Easy Driver is a simple to use stepper motor driver, and mates with the Firefly Interactive Prototyping Shield. The Easy Driver requires a 7V to 20V external power supply, which can be connected to the on-board barrel jack connector on the Firefly Interactive Prototyping Shield, to power the motor. The Easy Driver has an on board voltage regulator for the digital interface that can be set to 5V or 3.3V. Connect a 4-wire stepper motor and a microcontroller and you’ve got precision motor control! Easy Driver drives bi-polar motors, and motors wired as bi-polar. (i.e. 4,6, or 8 wire stepper motors). Note: This is the newest version of the EasyDriver V4 shield manufactured by Sparkfun Electronics in collaboration with Brian Schmalz. MS1 and MS2 pins broken out to change micro-stepping resolution to full, half, quarter and eighth steps (defaults to eighths). Compatible with 4, 6, and 8 wire stepper motors of any voltage. Adjustable current control from 150mA/phase to 750mA/phase. Power supply range from 7V to 20V. The higher the voltage, the higher the torque at high speeds. 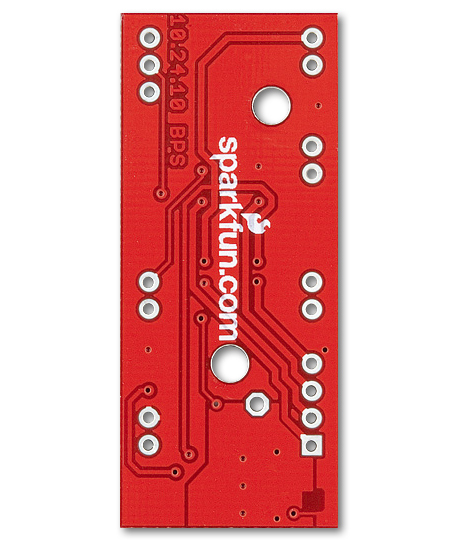 Note: The Easy Stepper Driver comes with headers soldered onto the board so that it mates with the Firefly Interactive Prototyping Shield.